Landscape artist, Christopher Shearer was born in Reading, Pennsylvania in 1846. As a child, Shearer spent time in the studios of artists F. D. Devlan and J. Heyl, and in 1864, he produced his first painting. He became a student, of both Devlan and Raser, and his father helped him by building him a studio in the backyard of his Shearertown farm. At the age of 21, Shearer opened a studio in Reading and was very successful in selling his works. He later traveled to Europe, and studied in Dusseldorf and Munich. In 1878, on a return trip to Germany, he was awarded a Gold Medal by the Dusseldorf School of Art. 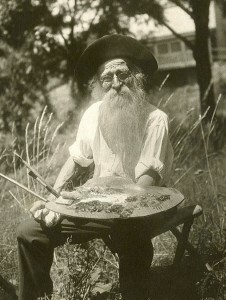 Shearer exhibited his works at the Pennsylvania Academy of the Fine Arts, and the art exhibition of the Centennial. He also had many of his works hanging in the Reading Museum. 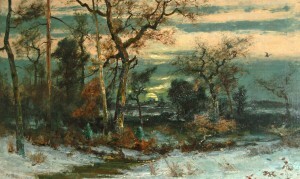 His paintings are part of several collections, including ones in Canada, Australia, Germany, and America. Shearer was a teacher, as well as being an artist. He also enjoyed collecting butterflies, moths and bugs, and he kept detailed records and drawings of these insects. The artist died in 1926.